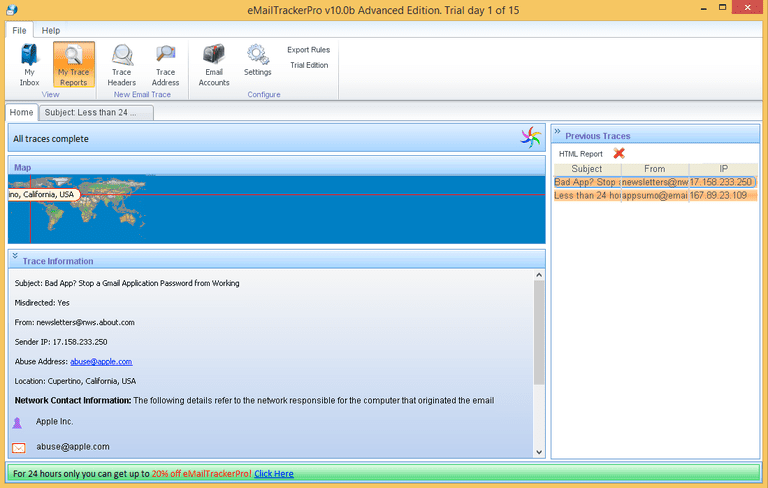 eMailTrackerPro is an easy to use tool for analyzing email headers to disclose the original sender's (or spammer's) location. You can also send spam complaints correctly and easily with it. However, as a spam filter, eMailTrackerPro is not ideal. On the internet, the things you can do anonymously amount to pretty much -- nothing. Nevertheless, spammers try to disguise their real identity and location, usually in vain. A look at the email headers will, at least in some cases, reveal the whereabouts of the spammer, or at least who their Internet Service Provider is. Unfortunately, decoding these headers manually is cumbersome, boring and time-consuming. Fortunately, there are tools like eMailTrackerPro. eMailTrackerPro analyzes header lines, providing the IP addresses of computers used to send the email. To discover potential spam, eMailTrackerPro uses header line mistakes and mismatches as well as DNS blacklists and filters (including local lists of safe and blocked senders). The geographic location of origin for traced email is shown on a map. Whois contact data for the network where an email originated as well as for the sending address is readily available. You can set up POP email accounts to report spam with ease and filter email at the server. A plug-in for Microsoft Outlook (2003 and 2007) provides easy access. Email headers can also be copied and pasted from any email program. You can send a spam report quickly and effortlessly right from eMailTrackerPro. Feed eMailTrackerPro with the headers, and it will analyze them to eventually present the sender's geographic location and either their or their ISP's IP address and contact information. Based on this analysis, eMailTrackerPro makes it easy and comfortable to send abuse reports to the ISPs providing the spammer with network access. It generates a new message in your default email program already addressed to the ISP’s abuse department as well as a spam report to send. While generally accurate, I have found these reports to be overly rigid sometimes and suspect spam and forgery where there is none. Forwarded and redirected emails, in particular, can throw eMailTrackerPro off. You can set up an email account (using POP) in eMailTrackerPro both to avoid pasting email headers and to have suspect messages in that account deleted right at the server. For this, you can set up quite sophisticated filters, maintain local black and white lists of senders and have eMailTrackerPro check DNS blacklist servers. As a spam filter, eMailTrackerPro is still of limited use, though. Just about any email service’s spam filter should yield at least similar results with less maintenance. To analyze an email's header lines, you can also use What Is My IP Address's online Trace Email tool. For reporting spam, SpamCop also works well and across platforms as a web-based tool.